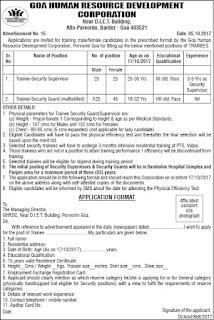 A vacancy advertisement as Goa HRDC Recruitment has been published by Goa Human Resource Development Corporation to inform the Skilled & well qualified Indian Nationals for the 620 positions of Trainee Security Supervisor, Security Guard. Eligible Contenders can apply for Goa HRDC vacancy by submitting their prescribed application form on or before the end date that is 17th October 2017. Required Qualification: Aspirants must have 8th / 12th from well recognized Board/ University/ Institute according to post. 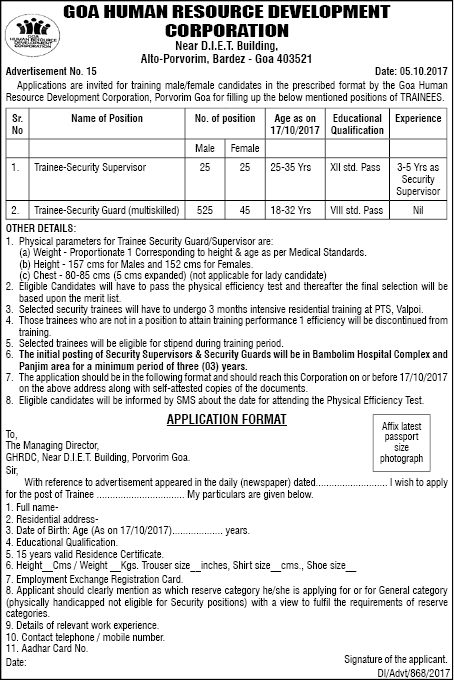 The candidate’s age should be in between 25 to 35 Years (for Security Supervisor), 18 to 32 Years (for Security Guard). Contenders, interested to apply against Goa Human Resource Development Corporation recruitment they have to go through the Physical Efficiency Test round that will be organized by the recruitment panel of organization. This will open a list of the links having latest openings and candidates have to select the most appropriate link which will open the complete advertisement having further details regarding Goa HRDC Vacancies. Goa Human Resource Development Corporation, Near D.I.E.T. Building, Alto-Porvorim,- Bardez – Goa 403521. Deadline to Submit Hard Copy of Application Form Is : 17-10-2017.